Al Gore is the only Nobel Prize winner, whose work was ruled politically biased and containing nine major scientific errors by a court (UK) a week before it was awarded. The Nobel Committee should have known. They could argue they’d already made their decision. Problem is there was considerable evidence about the errors easily available long before. Clearly they didn’t do their homework, so their decision was purely political. The Prize should be revoked. Gore shared his prize with the members of the Intergovernmental Panel on Climate Change (IPCC). He used their research, but went further. He misused it to achieve the falsehoods that permeate his movie An Inconvenient Truth. Now we know through the files obtained from the Climatic Research Unit in East Anglia (Climategate), that all the information put in the global arena was falsified, manipulated and deliberately made wrong. 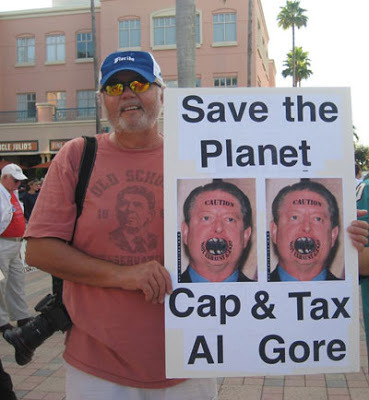 Silence of those involved in climategate about Gore’s misuse of their false data tells several stories. They couldn’t point out the error and risk exposure. Like everything they did the end justified the means. Gore was useful. He distracted the mainstream media and kept the global warming pot boiling while they had access to power behind the scenes through the IPCC. He was the buffoon who distracted the audience from the real villains. Again the Nobel committee didn’t do their homework and made a political decision. This Prize should also be revoked. Nothing Nobel: Time To Terminate The IPCC. The IPCC Nobel Prize was questionable in the first place. There are serious questions about giving a Nobel Prize to government employees. Why didn’t the prize money go back to the taxpayer who funded the work? How did they divide the money? Did the CRU gang receive more because they controlled most of the process? Regardless, all the money should come back, just like Olympic Gold medals are withdrawn from members of a team if one member has cheated. IPCC members were eager to be on board the ship and should have known about the corruption. Several prominent members with integrity resigned including Richard Lindzen and Chris Landsea; they should receive the Prize taken from those who participated. If outsiders like myself could see the problems then there is no excuse for those inside. The IPCC has completely lost all credibility and should be terminated immediately. The current Chairman R.K.Pachauri received the Nobel Prize on behalf of the IPCC. As Chair he is also a recipient. As a railway engineer he went off the tracks in his apparent craving for power. He is also cc’d on many of the emails obtained by climategate so he clearly knew what was going on. That is completely unacceptable.